…and not all of it good, although I wouldn’t trade the experience. Since there is so much, I will divide into three posts with three photo collections. First, the arrival. We took a boat crossing from Chiang Khong and upon arrival, immediately got ripped off by some guy posing as the immigration officer. He was right at the landing wearing an official looking shirt and charged us 200 baht (about 6 dollars) more than he should have for our visas, pocketing the difference and then having hte gall to try to sell us a boat tour. We were pissed, but it seems like a right of passage to every country to get ripped off at least once. 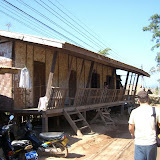 Once in Laos and Huay Xai, I discoved what the third world is REALLY like. By comparison, Thailand seems super sophisticated and developed. See the pics to believe what I am saying, but there was almost no road, an open sewer, no real infrastructure other than ad hoc. The food was questionable and the huge number of tourists waiting to take a trek or trip down the Mekong only added to the disorientation. This place had never really been anything but a dump, and even so had been ruined by recent tourism. We left the next morning to take a one day slow boat to Loung Probang via the Mekong. See the next post for that experience. This entry was posted in Satori, Greatest Hits.